Last week was indulgent to say the least, me and plenty of my culinary colleagues who attended the same conference in Austin, Texas, indulged in a near- or at-capacity amount of barbecue, tacos, Dorie Greenspan cookies, margaritas, brisket sandwiches, you name it — we ate up the city for days on end. And I don’t think any of us regret a single bite. But there’s been a common refrain now that we’re back home. The relief that comes with being able to eat a bit lighter, to not feel obligated to hit a ton of restaurants every day to make the most of a brief excursion into a city like Austin. The first dinner I cooked after being home was a household favorite, super basic roasted chicken with herbs and onions. I cooked up some green lentils and tossed them with sauteed rainbow chard, garlic, onions to serve alongside. Ahhh, nice to be home again!! Last night, I was motivated to pull an old-school sauce/condiment/dressing out of my memory-box to serve with one of our favorite vegetables: cauliflower. I can’t remember a time when I didn’t like cauliflower. Which probably has a lot to do with the fact that my mom cooked it in that classic fashion, slathered with delicious, rich cheese sauce. And I’m all over that combination, it’s a classic that I just try to not indulge in too often these days. Instead, I’ve taken to coarsely chopping a head of cauliflower, drizzling it with a bit of olive oil and seasoning liberally with ground cumin and ground coriander. Roast it in a 375 F oven until tender and at least some of the pieces are richly browned, there are few side dishes I love more than that one. But last night, the stars aligned to make me think about gribiche rather than cumin. I’d whipped up a gribiche for cauliflower some other time in this past year, but what inspired that earlier venture, I have no idea. Technically, I shouldn’t like gribiche because for as long as I can remember, capers and I just don’t see eye to eye. Which may have something to do with the fact that sometime early on I took one look at a caper and it reminded me of lizard eyes. I have not idea….. But they are growing on me as my palate continues to mature I guess. It’s interesting how little attention gribiche gets in standard resources. It’s not in The New Food Lover’s Companion , I found only a few recipes in the gribiche vein from the massive data base at epicurious.com, my copy of Larousse Gastronomique gives it the briefest of mentions, citing it as good for “cold fish and crustaceans.” It was interesting to see Molly Wizenburg’s post on the subject a couple of years ago, commenting on the fact that when she did find a gribiche recipe it was likely to not jibe at all with others she’d come across. Apparently more of a concept — sauce-like concoction based on hard-cooked eggs, capers and pickles — than a hard and fast formula. So here’s how I tackled the concept of gribiche for dinner last night. Chopped a few tablespoons of capers, added them to the bowl with a tablespoon or so of Dijon mustard, a good glug (1/4 cup perhaps?) of white wine vinegar and about the same of olive oil. Tossed in a good dose of chopped chives from the garden as well; would have added parsley but mine bolted in the past week or two. Salt, pepper, whip it all together. Let it just sit there and get all delicious while I broke up a head of cauliflower into small florets and steamed them just until nearly tender. While still warm, I added the cauliflower to the gribiche, stirred it around gently with a large spatula to evenly coat the cauliflower with the sauce, and let cool just a bit before serving. I find the flavors more balanced and enjoyable when warm at the most. In fact, I’m having a bowl of the cold leftover cauliflower today for lunch and it’s great at that temp as well. As simple as that. 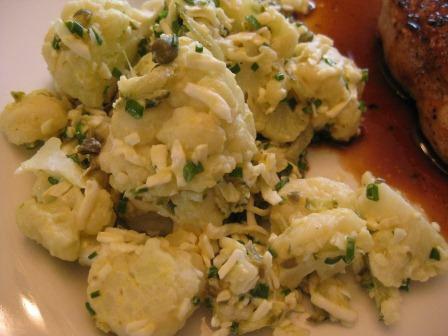 Though I seem to be stuck on pairing gribiche with cauliflower, will try to branch out next time and try it with green beans, asparagus, boiled new potatoes…. Definitely livens up the party with some sassy, piquant flavor.